Having brought a brittle grace to adaptations of Pride and Prejudice and Atonement, director Joe Wright makes a splashy stateside debut with The Soloist, a true-life drama about an unexpected friendship between world-weary LA journalist Steve Lopez (Robert Downey Jr) and homeless musician Nathaniel Ayers, played by Jamie Foxx. Recognising that Ayers is a gifted musician who cracked up under the pressures of the prestigious Julliard music school, Lopez writes regular newspaper copy about the musician’s skid-row predicament, leading to a volatile friendship between the two men. The always charismatic Downey Jr makes an ideal filter to help dodge the inherent sentimentality of Ayer’s story, offering a welcome strain of laconic exasperation that still isn’t enough to offset Foxx’s mugging performance or the inbuilt do-goodery of the whole enterprise. Yet The Soloist sometimes soars, with Wright and cinematographer Seamus McGarvey conjuring powerful poetic visuals to match the agony and the ecstasy of the Bach and Beethoven on the soundtrack, providing a window into the soul of the artist which snaps shut whenever the screen-writing conventions kick in. 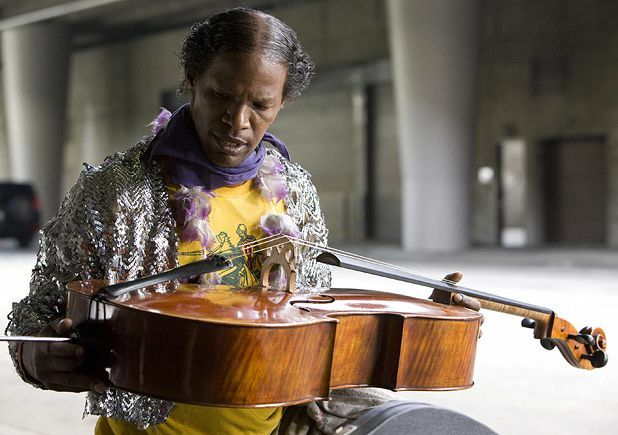 The Soloist isn’t a bad effort from Wright, but it falls well short of the greatness it clearly aspires to. Wright makes a splashy stateside debut with this true-life drama about an unexpected friendship between world-weary LA journalist Steve Lopez (Downey Jr) and homeless musician Nathaniel Ayers (Foxx). This isn't a bad effort, but it falls well short of the greatness it clearly aspires to.